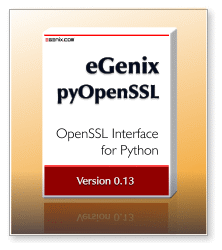 eGenix is pleased to announce the eGenix pyOpenSSL Distribution 0.13.16 for Python 2.4 - 2.7, with source, OpenSSL 1.0.2j libraries, CA bundles and binaries for Windows, Linux, Mac OS X and FreeBSD. OpenSSL is an open-source implementation of the SSL/TLS protocol. Please see the product changelog for the full set of changes. In addition to providing sources, we make binaries available that include both pyOpenSSL and the necessary OpenSSL libraries for all supported platforms: Windows, Linux, Mac OS X and FreeBSD, for x86 and x64. will get you the package with OpenSSL libraries installed. Please see our installation instructions for details. We have also added .egg-file distribution versions of our eGenix.com pyOpenSSL Distribution for Windows, Linux and Mac OS X to the available download options. These make setups using e.g. zc.buildout and other egg-file based installers a lot easier. Please visit the eGenix pyOpenSSL Distribution page for downloads, instructions on installation and documentation of the package. Before installing this version of pyOpenSSL, please make sure that you uninstall any previously installed pyOpenSSL version. Otherwise, you could end up not using the included OpenSSL libs. For more information on the eGenix pyOpenSSL Distribution, licensing and download instructions, please write to sales@egenix.com.